Head-mounted eye-tracking experiments monitoring participants' eye movements while they listen to pre-recorded auditory stimuli either to manipulate real world objects or to click on items in visual scenes displayed on a computer monitor. 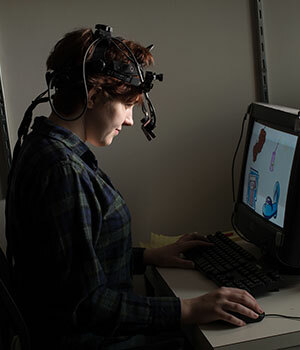 Scene verification experiments probing participants' interpretations of pre-recorded auditory stimuli using visual scenes displayed on a monitor. Various types of experiments examining participants' judgments of the acceptability of linguistic stimuli. Stephanie Huston, Linguistics BA 2010, Linguistic Analyst, Verilogue, Inc.
Neal Snider, Center for Language Sciences postdoc 2008-2010, Senior NLP Research Engineer, Nuance Communications, Inc.
Runner, Jeffrey T. and Alyssa Ibarra. (2016). Information structure effects on null and overt subject comprehension in Spanish. To appear in Holler, A., Goeb, C. and Suckow, K. (eds. ), Empirical Perspectives on Anaphora Resolution: Information Structural Evidence for the Race for Salience. De Gruyter. Xu, Yuhang & Jeffrey T. Runner. (2016). Reflexive Retrieval in Mandarin Chinese: Evidence against the Local Search Hypothesis. Poster presented at CUNY 29. University of Florida. Xu, Yuhang & Jeffrey T. Runner. (2016). Locality effects in long-distance reflexive retrieval: the case of Mandarin Chinese ziji. Poster presented at 90th Annual Meeting of the Linguistic Society of America. Washington, DC. Kim, Christina, Christine Gunlogson, Michael Tanenhaus & Jeffrey T. Runner. (2015). Context-driven expectations about focus alternatives. Cognition 139: 28-49. Runner, Jeffrey T. & Amanda Baker. (2015). New evidence for sensitivity to syntax in English verb phrase ellipsis. Poster presented at CUNY 28. University of Southern California. Runner, Jeffrey T. & Kellan D.L. Head. (2014). What Can Visual World Eye-tracking Tell Us About the Binding Theory? In Christopher Piñón (ed. ), Empirical Issues in Syntax and Semantics 10, Paris. CSSP–Colloque de Syntaxe et Sémantique à Paris: 269-286. Runner, Jeffrey T. & Kellan Head. (2013). What can visual world eye-tracking tell us about the binding theory? Paper presented at the Colloque de Syntaxe et Sémantique à Paris. Dozat, Timothy A. & Jeffrey T. Runner. (2013). Someone will attend this talk (and it definitely should be! ), I just don’t know by whom: An analysis of voice mismatch in VP ellipsis and sluicing. Paper presented at the Colloque de Syntaxe et Sémantique à Paris. Dozat, Timothy & Jeffrey T. Runner. (2013). Information structure and the ‘height’ of ellipsis. Poster presented at CUNY 26. University of South Carolina. Fine, Alex & Jeffrey T. Runner. (2013). The effect of predictability in elided vs. non-elided constituents. Poster presented at CUNY 26. University of South Carolina. Head, Kellan & Jeffrey T. Runner. (2013). Assessing the on-line application of binding constraints without gender stereotype. Poster presented at CUNY 26. University of South Carolina. King, Sharese & Jeffrey T. Runner. (2013). The interpretation of elided reflexives in children and adults. Poster presented at CUNY 26. University of South Carolina. Dozat, Timothy A. & Jeffrey T. Runner. (2012). Voice parallelism in sluicing and VP ellipsis. Paper presented at the Annual Meeting of the Linguistic Society of America. Kim, Christina, Timothy Dozat & Jeffrey T. Runner. (2012). Question structure and ellipsis. Poster presented at CUNY 25. City University of New York. Runner, Jeffrey T. & Elsi Kaiser. (2011). Inter- and Intra-Clausal Pronoun Resolution. In Proceedings of the 8th Discourse Anaphora and Anaphor Resolution Colloquium. Runner, Jeffrey T. and Timothy A. Dozat. (2011). A brief report on voice mismatch effects in verb phrase ellipsis and sluicing. In A. Fine (Ed. ), University of Rochester Working Papers in the Language Sciences. Kim, Christina & Jeffrey T. Runner. (2011). Discourse Structure and Syntactic Parallelism in VP Ellipsis. In Jesse A. Harris & Margaret Grant (Eds.) University of Massachusetts Occasional Papers in Linguistics: Processing Linguistic Structure. Volume 38. GLSA Publishing. Amherst, MA. Runner, Jeffrey T. & Elsi Kaiser. (2011). Inter- and Intra-Clausal Pronoun Resolution. Paper presented at the 8th Discourse Anaphora and Anaphor Resolution Colloquium. Faro, Portugal. Snider, Neal & Jeffrey T. Runner. (2011). Phonological structure is reactivated in VP ellipsis: evidence from eye movements. Paper presented at the 85th Annual Meeting of the Linguistic Society of America. Runner, Jeffrey T. & Christina Kim. (2011). Two (potential) differences between VP ellipsis and pseudogapping. Poster presented at Architectures and Mechanisms of Language Processing. Paris. Kim, Christina & Jeffrey T. Runner (2011). Syntactic Identity Isn’t Enforced Blindly: VP Ellipsis and Pseudogapping. Poster presented at the 85th Annual Meeting of the Linguistic Society of America. Pittsburgh. Snider, Neal & Jeffrey T. Runner (2010). Structural Parallelism Aids Ellipsis and Anaphor Resolution Evidence From Eye Movements to Semantic and Phonological Neighbors. Paper presented at Architectures and Mechanisms of Language Processing. York, England. Snider, Neal & Jeffrey T. Runner (2010). The role of structural parallelism on anaphoric antecedent resolution. Poster presented at CUNY 23. New York University. The role of syntactic structure in the interpretation of elided anaphors, testing theories of binding and theories of ellipsis. The role of the representational nature of PNPs and parallels with other types of representational interpretations, namely 'statue' interpretations of nominals; investigating conceptual versus structural characteristics of anaphora. Goldwater, Micah & Jeffrey T. Runner (2008) The Representational Nature of Representational NP's: Using the Visual World Eye-Tracking Paradigm, poster presented at the 21st annual CUNY conference on human sentence processing, University of North Carolina at Chapel Hill. Goldwater, Micah & Jeffrey T. Runner (2007). An Experimental Investigation of the Representational Nature of Representational NPs. Talk presented at Texas Linguistic Society, UT Austin. Goldwater, Micah & Jeffrey T. Runner (2007). Reference transfer and reflexive interpretation in representational noun phrases. Talk presented at the 81st Annual Meeting of the Linguistic Society of America, Anaheim, California. Goldwater, Micah B. & Runner, Jeffrey T. (2006). Coreferential interpretations of reflexives in picture noun phrases: an experimental approach. In P. Denis, E. McCready, A. Palmer & B. Reese (Eds.) Proceedings of the 2004 Texas Linguistics Society Conference. 28-34. Somerville, MA: Cascadilla Proceedings Project. Goldwater, Micah & Jeffrey T. Runner (2006). The Role of Representation in Representational Noun Phrases, poster presented at the 19th annual CUNY conference on human sentence processing, City University of New York. Runner, Jeffrey T. (2005) Coreferential and Bound Variable Interpretations: an Experimental Investigation, keynote address presented at HPSG 2005, Lisbon. The structural and discourse relations between elided material and its linguistic antecedent, focusing on the interaction of structural form and discourse parallelism. Kim, Christina & Jeffrey T. Runner (2009). When syntactic parallelism is really discourse parallelism in VP ellipsis. Poster to be presented at the 83rd Annual Meeting of the Linguistic Society of America. Runner, Jeffrey T. & Christina Kim (2008) Are syntactic effects in VP ellipsis really discourse effects? Invited talk, Workshop "Language, Linguistics & Neurocognition," Utrecht University, UIL OTS. Kobele, Gregory, Christina Kim, John Hale & Jeffrey T. Runner (2008). A processing model for ungrammatical verb phrase ellipsis. Talk presented at the 21st annual CUNY human sentence processing conference, University of North Carolina at Chapel Hill. Kim, Christina, Christine Gunlogson, Michael K. Tanenhaus & Jeffrey T. Runner (2008). Focus Alternatives and Contextual Domain Restriction: a Visual World Eye-tracking Study on the Interpretation of Only. Paper presented at Sinn und Bedeutung, Stuttgart University. Kim, Christina, Christine Gunlogson, Michael K. Tanenhaus & Jeffrey T. Runner (2008). Focus alternatives and contextual domain restriction: an eye-tracking study on the interpretation of "only". Poster presented at Architectures and Mechanisms of Language Processing Conference, Cambridge University. Kim, Christina, Christine Gunlogson, Michael K. Tanenhaus & Jeffrey T. Runner (2008). Information integration and domain restriction: Interpreting 'only' in context, poster presented at the 27th West Coast Conference on Formal Linguistics, UCLA. Kim, Christina, Christine Gunlogson, Michael K. Tanenhaus & Jeffrey T. Runner (2008) Domain narrowing: Interpreting 'only' in context, poster presented at the 21st annual CUNY conference on human sentence processing, University of North Carolina at Chapel Hill. The effects of verbal semantics and pragmatics on the interpretation of pronouns and reflexives in PNPs in English, Finnish, German and Dutch. Kaiser, Elsi & Jeffrey T. Runner. (2008). Intensifiers in German and Dutch Anaphor Resolution. In Proceedings of the 27th West Coast Conference on Formal Linguistics, ed. Natasha Abner and Jason Bishop, 265-273. Somerville, MA: Cascadilla Proceedings Project. Kaiser, Elsi & Jeffrey T. Runner (2008). A comparative investigation of anaphor resolution in German and Dutch, poster presented at the 21st annual CUNY conference on human sentence processing, University of North Carolina at Chapel Hill. Kaiser, Elsi, Runner, Jeffrey T., Sussman, Rachel S. & Tanenhaus, Michael K. (in press). The interpretation of pronouns and reflexives in picture noun phrases: effects of non-structural factors. In A. Alcazar, R. Mayoral Hernandez and M. Temkin Martinez (Eds. ), Proceedings of the Western Conference on Linguistics 2004. Fresno, CA: California State University at Fresno. Kaiser, Elsi, Jeffrey T. Runner, Rachel S. Sussman and Michael K. Tanenhaus (2007). Picturing the syntax/semantics interface during on-line processing. Talk presented at the On Linguistic Interfaces conference, University of Ulster, Jordanstown campus, N. Ireland. Kaiser, Elsi, Jeffrey T. Runner, Rachel S. Sussman and Michael K. Tanenhaus (2007). On the interplay of syntactic and semantic effects on anaphor resolution. Talk presented at the 43rd Annual Meeting of the Chicago Linguistic Society, University of Chicago. Kaiser, Elsi, Runner, Jeffrey T., Sussman, Rachel S. & Tanenhaus, Michael K. (2007). The real-time interpretation of pronouns and reflexives: Structural and semantic information. In Proceedings of North Eastern Linguistic Society Conference 37. Kaiser, Elsi, Jeffrey T. Runner, Rachel S. Sussman and Michael K. Tanenhaus (2007). Pronouns as reflexives? A look at prenominal possessive pronouns. Talk presented at the 81st Annual Meeting of the Linguistic Society of America, Anaheim, California. Kaiser, Elsi, Jeffrey T. Runner, Rachel S. Sussman & Michael K. Tanenhaus (2005). What influences the referential properties of reflexives and pronouns in Finnish? In Christian Ebert & Cornelia Endriss (Eds.) Proceedings of Sinn und Bedeutung 10. 155-169, ZAS Working Papers in Linguistics No. 44 Vol. 1, Berlin. Kaiser, Elsi, Jeffrey T. Runner, Rachel S. Sussman & Michael K. Tanenhaus (2005).Whose picture? Reference resolution in and out of picture NPs, poster presented at the 18th annual CUNY conference on human sentence processing, University of Arizona. Kaiser, Elsi, Jeffrey T. Runner, Rachel S. Sussman & Michael K. Tanenhaus (2005). Reference resolution for reflexives and pronouns in Finnish, poster presented at the 18th annual CUNY conference on human sentence processing, University of Arizona. Kaiser, E., Runner, J.T., Sussman, R.S. & Tanenhaus, M.K. (2004), Pronouns, reflexives, Binding Theory, and information flow, poster presented at Architectures and Mechanisms of Language Processing (AMLaP), Aix-en-Provence, France. Kaiser, E., Runner, J.T., Sussman, R.S. & Tanenhaus, M.K. (2004). An experimental approach to short-distance pronouns and logophoric reflexives, paper presented at the Workshop on Semantic Approaches to Binding Theory, Nancy, France. The structure and interpretation of picture NPs with and without possessor phrases (e.g., 'Harry's picture of himself/him', 'a picture of her/herself'). Runner, Jeffrey T. (2007) Free Picture NPs from Binding Theory, in Jill Thorson & Lynsey Wolter, eds., University of Rochester Working Papers in the Language Sciences, 3.1, 57-90. Runner, Jeffrey T., Rachel S. Sussman & Michael K. Tanenhaus (2006). Assigning Reference to Reflexives and Pronouns in Picture Noun Phrases, Cognitive Science 30, 1-49. Runner, J. T., Sussman, R.S. & Tanenhaus, M. K. (2006). Reflexives and pronouns in picture noun phrases: using eye movements as a source of linguistic evidence. In S. Kepser & M. Reis (Eds.) Linguistic Evidence. Mouton de Gruyter. Runner, Jeffrey T. and Elsi Kaiser. (2005). Binding in Picture Noun Phrases: Implications for Binding Theory. In Stefan Müller, editor, The Proceedings of the 12th International Conference on Head-Driven Phrase Structure Grammar, Department of Informatics, University of Lisbon. 594-613. Stanford: CSLI Publications. URL: http://cslipublications.stanford.edu/HPSG/6/. Runner, Jeffrey T. (2004) Insights into Binding and Ellipsis from Head-mounted Eye-tracking Experiments, in Jonathon E. Cihlar, David W. Kaiser, Irene Kimbara, and Amy Franklin (eds. ), CLS 39 The Panels: Proceedings from the Panels of the Thirty-Ninth Meeting of the Chicago Linguistic Society. Runner, Jeffrey T., Sussman, Rachel S. and Tanenhaus, Michael K. (2004). The Influence of Binding Theory on the On-Line Reference Resolution of Pronouns. In M. Wolf & K. Moulton (Eds.) Proceedings of North Eastern Linguistic Society 34. Runner, Jeffrey T., Rachel S. Sussman and Michael K. Tanenhaus (2003) Assignment of Reference to Reflexives and Pronouns in Picture Noun Phrases: Evidence from Eye Movements, Cognition 89, B1-B13. Runner, Jeffrey T., Rachel S. Sussman and Michael K. Tanenhaus (2003) The Influence of Binding Theory on the On-Line Reference Resolution of Pronouns, poster presented at North Eastern Linguistic Society 34, SUNY Stony Brook. Runner, Jeffrey T., Rachel S. Sussman and Michael K. Tanenhaus (2002) Binding Reflexives and Pronouns in Picture Noun Phrases, 8th Annual Conference on Architectures and Mechanisms for Language Processing, Tenerife, Spain. Runner, Jeffrey T., Rachel S. Sussman and Michael K. Tanenhaus (2002) Logophors in Possessed Picture Noun Phrases, in L. Mikkelsen and C. Potts, eds., WCCFL 21 Proceedings, pp. 401-414. Somerville, MA: Cascadilla Press. Runner, Jeffrey T. (2002) When Minimalism isn't Enough: an Argument for Argument Structure, Linguistic Inquiry 33.1. Runner, Jeffrey T., Rachel S. Sussman & Michael K. Tanenhaus (2001) The Role of Binding Theory in the On-line Reference Resolution of Reflexives, poster presented at CUNY Human Sentence Processing Conference, U. Penn. Runner, Jeffrey T., Rachel S. Sussman and Michael K. Tanenhaus (2000) Binding Reflexives and Pronouns in Real-time Processing, poster presentation at the CUNY Human Sentence Processing Conference, San Diego.